Most companies aren’t able to make and execute good decisions. People in these organizations dither. They make decisions that turn out to be wrong, or that can’t be acted upon. The whole process of making and executing a decision takes too long and eats up too much time and effort. Even when a decision has apparently made, passive resistance (or worse) means that action to implement it is slow and sporadic. These companies’ financial performance suffers accordingly—and they fall behind more decisive competitors. But some companies have learned the organizational secrets of making and executing good decisions day in and day out. From the strategic decisions of top management all the way through to the on-the-spot decisions of front-line employees, they know how to decide and how to act, at speed and with an appropriate amount of effort. New research—reported for the first time in this book—shows that these decision-driven organizations significantly outperform their competitors. Their decisions are better and are translated more effectively into action. Their decision cycles are shorter than those of competitors, and their decision-and-execution processes tailor the effort expended to the importance of the decision. Their financial results, typically, are head and shoulders above their peers. What are the secrets that make it all possible? It isn’t just a matter of getting your organizational structure right, even though the importance of structure is burned deep into the subconscious of many executives. Today’s business world is far too complex and fast-paced for purely structural solutions, and companies that rely on structural change alone risk adding to rather than reducing complexity. The real secret isn’t a structure. The key is to create a decision-driven organizational environment, in which the pieces all fit together to help people throughout the organization make good decisions and make them happen, quickly. Decide and Deliver is the road map. 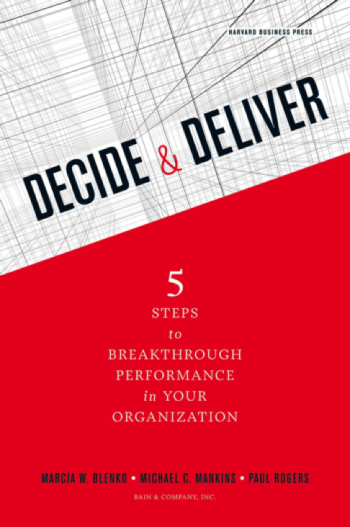 It is the only book that shows how to build an integrated decision-driven organization. It shows them how to eliminate the dithering, open up the bottlenecks that get in the way of good decisions, and help everyone in the organization learn to make and execute good decisions quickly. It shows leaders how to avoid the obstacles that prevent good decisions and undermine performance, from lack of cohesion in the leadership team itself to the proliferation of unnecessary meetings and committees. It will help them build more profitable companies.